Lennon began writing "Strawberry Fields Forever" in Almería, Spain, during the filming of Richard Lester's How I Won the War in September–October 1966. The Beatles had just retired from touring after one of the most difficult periods of their career, including the "more popular than Jesus" controversy and the band's unintentional snubbing of Philippines First Lady Imelda Marcos. Like "Penny Lane", which Paul McCartney wrote in late 1966 in response to Lennon's new song, "Strawberry Fields Forever" conveys nostalgia for the Beatles' early years in Liverpool. 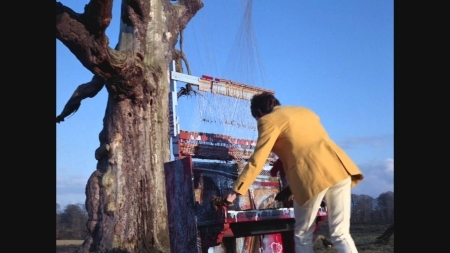 While both songs refer to actual locations, McCartney said that the two pieces also had strong surrealistic and psychedelic overtones. George Martin, the Beatles' producer, recalled that when he first heard "Strawberry Fields Forever", he thought it conjured up a "hazy, impressionistic dreamworld". As with his Revolver compositions "Tomorrow Never Knows" and "She Said She Said", "Strawberry Fields Forever" was informed by Lennon's experiences with the hallucinogenic drug LSD, which caused him to question his identity and seek to dissolve his ego. Lennon talked about the song in 1980: "I was different all my life. The second verse goes, 'No one I think is in my tree.' Well, I was too shy and self-doubting. Nobody seems to be as hip as me is what I was saying. Therefore, I must be crazy or a genius – 'I mean it must be high or low' ..." He termed the song "psychoanalysis set to music". In McCartney's view, the lyrics reflect Lennon's admiration of the nineteenth-century English writer Lewis Carroll, particularly his poem "Jabberwocky".